We have been getting flooded with inquiries about making passes down the track. *Bring your PayPal Receipt with you to the gate if you Prepaid!!! W: Dan Yost (’07 300 SRT) – 13.332, 98.18 (13.46 dial). R/U: Todd Roberts (’06 300 SRT) – foul. W: Ken Schauer (’07 Charger) – 12.523, 109.02 (12.50 dial). R/U: Ben Maniaci (’07 Charger) – 12.362, 106.17 (12.50 dial). W: Bill McFadden (’07 Magnum) – 11.461, 118.71 (11.50 dial). R/U: Jeremy Webb (’09 Jeep SRT) – 11.400, 117.05 (11.50 dial). W: Guy Dalton (’05 Magnum) – 10.515, 119.33 (10.50 dial). R/U: Justin Skudder (’06 Charger) – 10.783, 127.50 (10.50 dial). Semi’s: Wendy Robertson; John Burleson. W: Marcus Hughes (’06 Jeep SRT) – 10.565, 137.02 (9.50 dial). R/U: Greg Davies (’06 Magnum) – 10.804, 136.07 (9.50 dial). Semi’s: Salvatore Iovino; Brian Brunt. W: Jimmy Koutsoubis (’07 Jeep SRT) – 9.548, 146.89. R/U: John Glass (’09 Challenger) – broke. W: Jamie Collingwood (’15 Hellcat) – 11.324, 123.17. R/U: Bill Cherry (’15 Hellcat) – 11.282, 122.67. W: Jimmy Koutsoubis (’07 Jeep SRT) – 9.501, 150.31 (9.31 dial). 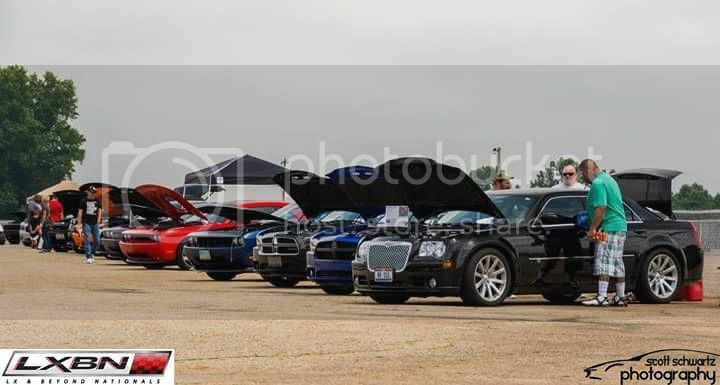 R/U: Marcus Hughes (’06 Jeep SRT) – 9.688, 142.12 (9.75 dial). Brian Brunt (’07 Jeep SRT) – broke. ONLINE REGISTRATION IS NOW LIVE!!! CAR SHOW AND RACING PARTICIPANTS SAVE YOURSELF SOME MONEY AND TAKE ADVANTAGE OF THE EARLY REGISTRATION DISCOUNT. WILL NOT BE OFFERED AFTER THE DEADLINE OR AT THE GATE. Early-Bird Car Show Pricing for 2016 LX & Beyond Nationals at Mopar Nationals is limited and ends in 1 week! Don’t miss out on killer savings. Remember that All Modern Mopar 1986-2016 in the car show at LXBN at Mopar Nats will be handled by our professional judges this year at the Mopar Nationals. Also, your entry will provide a 3-day weekend pass for you and 1 adult passenger for both events. Cars divided into weekend driver and daily driver classes so whether you are mildly modified or extreme there is an opportunity for everyone to join in on the fun. Click that link and get registered!!! Check our website for car show and racing details!